Indane allows their customers to book the refill through SMS or IVRS using enhanced Automated Unified System (AUS). This make refill booking faster, simpler and more efficient, enables to book the refills round the clock through SMS and IVRS supported dialing the xxxxxxxxxx. 1. Choose your language - 1 for local language, 2 for English and 3 for Hindi. Send SMS IOC < STD Code + Distributor's Tel. Number > < Consumer Number > to xxxxxxxxxx. an SMS < IOC > to the same mobile number where booking is made . Thanks for this step by step method to book indane gas online and availability in the Indian states. Download Rose Day Images 2017 from here. not working with the new 16 digit consumer number. Anyone else facing the problem? Yes I facing the problem. Yes, ivrs responds with msg-can't use this telephone for refill booking. Used to work till last month, not sure what broke? Hi Manish..Appreciate the efforts.. Can you help me with one thing. I have accidentally registered my mobile number for some other consumer number. Now, neither am able to de-register that nor register my correct consumer number. Left stranded. Can you please guide me? Thanks a for filtering and tabulating useful data for refill booking of LPG ...Thanks a heap man!! Thanks for providing stepwise procedure. Thanks for all the numbers, its big help. This is something which I was looking for. Thanks a ton for sharing this step by step procedure. 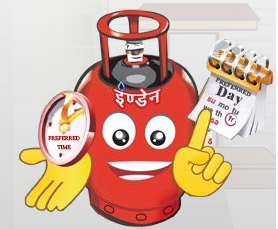 Please follow this video to steps for booking Indane gas cylinder online.